In this article I am going to talk about the Interface Builder and its main features that iOS developers use to design the user interface in their apps. A user interface file has either a .storyboard or .xib file extension. A xib file usually specifies one view controller or menu bar. A storyboard can have more view controllers and segues between those view controllers. By selecting the user interface file in the project navigator, the file’s contents open in Interface Builder in the editor area of the workspace window. Let’s start by creating a UIView that extends between the left and right margins of the screen and that it also edges the top of the screen, and for fun just give it a blue background. 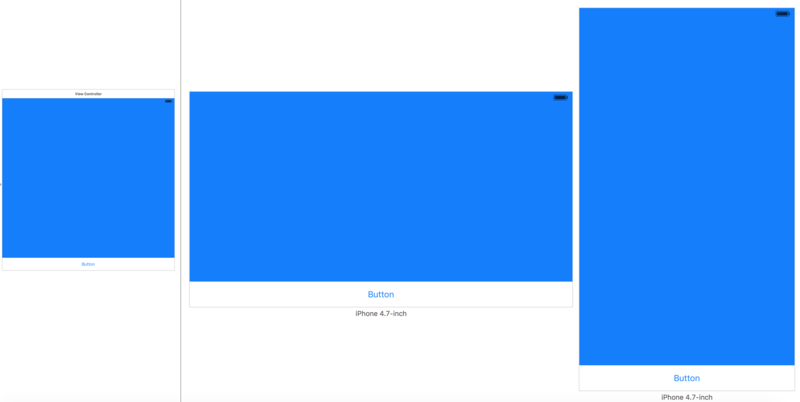 Below, create a UIButton that has the height 44 and which also extends between the left and right margins of the screen but this time it edges the bottom of the screen. Next, we want them to all have equal widths so they can fill the screen horizontally. We could just create constraints for each of them to match the width of the others, or we can use the new tool in iOS 9, the Stack View. Press and hold the Command key while selecting all the buttons, one at a time. With all the buttons selected, click the first icon (of the four) named Stack, which is located in the right bottom corner of the storyboard. Voila! The buttons are all stacked now and we do not need to arrange them in any way anymore. What if we were able to see in real time the effect of the changes we’re making in storyboard and in code? Good news, this is possible by using IBDesignable and IBInspectable. I will talk about them in a part two of this article.